There is a growing body of data that supports the idea that nature is highly beneficial for our bodies and minds. Get an overview of current findings from a wide variety of research-based studies. This presentation includes hands-on nature connection activities with Cayla Samano, a certified Forest Therapy Guide and Mentor. 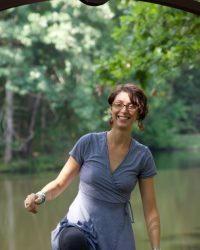 Cayla facilitates nature connection experiences in the Metro-Detroit Area and Ann Arbor. Her unique brand of forest therapy is inspired by Shinrin-Yoku, (forest -bathing) which started in Japan in the 1980s as a response to an over-stressed urban population. Cayla Samano has a bachelors in Visual Arts Education from eastern Michigan University and taught elementary art for ten years before becoming a forest therapy guide with the ANFT ( Association of Nature and Forest Therapy.) She is also an experienced illustrator, and created her first full length children's book about forest therapy for the ANFT in 2016.